Abdominal Crunches when performed correctly are the best abdominal exercises for strong, flat, six pack abs. Abs, as strong as they Look! When was the last time you showed your abs when asked "do you workout"? But what if I tell you that strong abs/core are the most important muscle group for lifting big and building muscle mass. Your priorities might change. And they should. Training your abdominal muscles provide you the strong base to lift bigger weights, lifting safety and generating power. Abdominal Crunches are one of the best exercises to get the job done. But there are safety issues, technique tricks and adding advanced variations you need to take care of to make crunches super-effective. Rectus Abdominis gives you the desired six pack abs look. Crunches are the most famous ab exercise and yet has received a lot of bad rep recently. There is some truth to the story. Most bodybuilders resorted to crunches as the sole ab exercise and defended the move. Big mistake. Crunches are the best exercise to target the 6 pack rectus abdominis muscle and does little to target the other two abdominal muscles namely tranversus abdominis and the oblique muscles. Without the other two muscles, your six packs will be bulging as a ship rudder with loose strings. With added abdominal fat, your crunches will yield no results as they will be hidden behind the fat. I cover the best way to get six pack abs in The Complete Guide to Six Pack Abs Section. Lie and bend seems like the easiest thing to do but there are few critical factors to make crunches very effective. The traditional crunch activates the hip flexor muscles and takes tension off the abdominals. This makes crunches ineffective. The solution? The Partner assisted Crunches. Here the steps. Lie on a flat mat with partner at your feet. Ask your partner to place his/her hands under the calf muscles. Place your hands on the sides of your hands gently or folded across your chest. keep your back, glutes and feet on the floor at all times. Step One: Crunch means bend. So begin. Curl yourself off the floor using your abdominal muscles while pressing your legs against the partners hands. Pressing against the hands contracts the quadriceps, hamstrings and glue muscles. 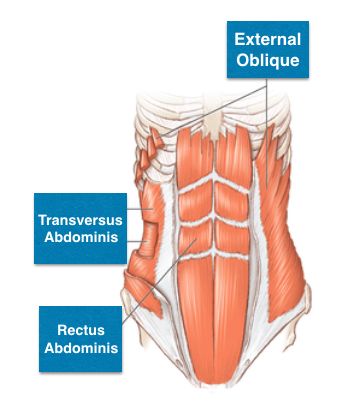 This inhibits the stronger hip flexor muscles and targets the abdominal muscle, the rectus abdominis. 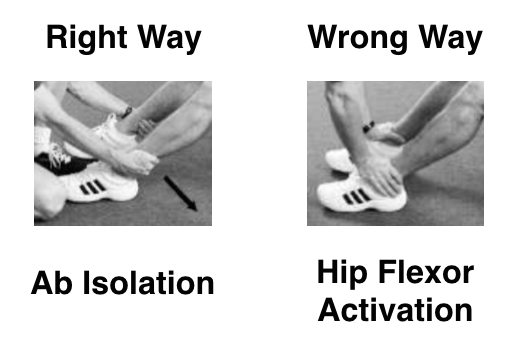 If hip flexor muscles work, you tire the back muscles and cause excessive strain on the back. 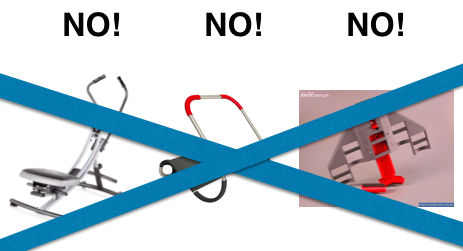 A big no no. Curl upto the point of full muscle contraction. Feel the tension in your abs. Key note on Breathing: Don’t hold your breathe, exhale on the way up. Holding your breathe reflexively inhibit the abdominal muscles. Its a little known neurological reflex phenomenon. Therefore perform crunches during exhalation. From the fully contracted position, inhale and lower yourself slowly in a controlled manner. Abdominal Machines try to make crunches strict by eliminating either hip joint action or putting direct pressure on the abdominals. But they offer no physiological advantage over doing crunches with good form. Stay away from ab machines. they restrict you in some way or another. Body works in unison, not isolation. I will show you how to make abdominal exercises harder for advanced training too. As you learnt in the beginning of this article, there are 3 abdominal muscles. So you need to train your transverses abdominis by holding your breath exercise and adding other exercises like hanging leg raises with bent knee for total abdominal muscular development. Try the NNMB Muscle Building Program for a ripped, muscular body. The fat burning section of the program shows you the way.